Cactus jewelry holder has two saguaro cactus for holding rings and a sandy speckled tray for bracelets, etc. Ceramic blooming cactus ring tray. 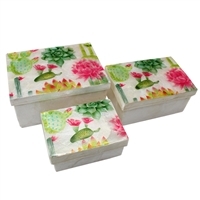 Green cactus with pink blossoms on a speckled ecru tray. Small green ceramic barrel cactus cup. Has "1/4 CUP" imprinted inside bottom of mug. See Photo. Can be used as a sake cup, teacup or even a tealight holder! Barrel cactus ceramic plate in beautiful green finish. Slightly raised and dotted ribbing. Each hand glazed and unique. Ceramic blooming cactus ring tray. Green and ecru. Ceramic green barrel cactus mug. Has "1 CUP" imprinted inside bottom of cup. See photo. WB exclusive succulent glass tray. 4pc minimum. Order in increments of 4. (Correction to catalog). Antiqued metal cactus hook. Green with little rusty accents. See EA813 - Our other cactus wall hook - They make a cute pair! 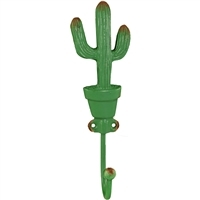 Prickly Pear Cactus Wall Hook with lively green finish on metal. Hand painted, rusting may vary. See EA805 - Our other cactus wall hook - They make a cute pair! 1 x 1.125 x 5.25"